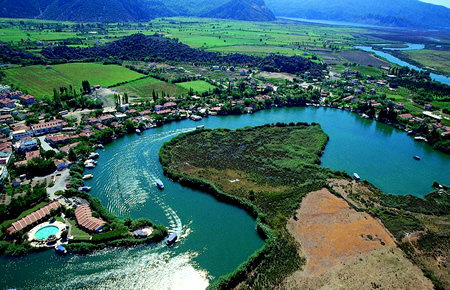 Following a short journey of 45 minutes, we arrive in Dalyan where we transfer into river boats to get to the sights of this unique area. The river boat cruise through the maze-like passages of tall reeds will surely remind you of Humphrey Bogart's & Catherine Hepburn's "The African Queen"
Turtle Beach, surrounded by salt water on one side and fresh water on the other, is one of the last breeding grounds of the Sea Turtles and therefore delightfully undeveloped. The one and half hours beach-break will be merely enough to savour the blessings this exceptional sand bank. The Mud Baths and Thermal springs of Dalyan have drawn in a legion of famous people over the years like Dustin Hoffman, Sting and David Bowie to name a few. Apparently it has worked for them, so why not let it work for you ?! 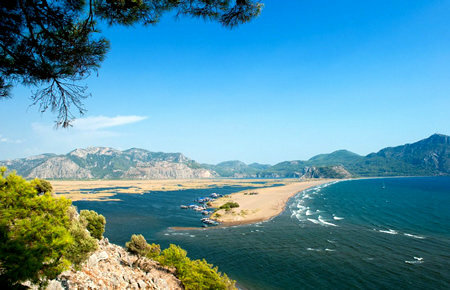 Daily trips from Marmaris to Dalyan visit the Turtle Beach, admire The Rock Tombs and enjoy the glorious Mud Baths.